Nearly 18,000 people in Finland signed Amnesty International Finland's petition, which was handed over to interior minister Kai Mykkänen on Tuesday. The Finnish branch of human rights group Amnesty International has submitted a petition signed by nearly 18,000 people to the interior ministry, demanding that Finland stop deporting people to Afghanistan. The petition was handed over to Interior Minister Kai Mykkänen on Tuesday morning in Helsinki, according to the human rights group. Shortly before that, just outside the ministry about 50-60 of the group's supporters held a demonstration, demanding that Finland halt deportations to Afghanistan. Demonstrators, standing in the grey, damp autumn weather, held signs and placards printed with statements in Finnish such as "Afghanistan is not safe" and "Why don't you believe experts?" 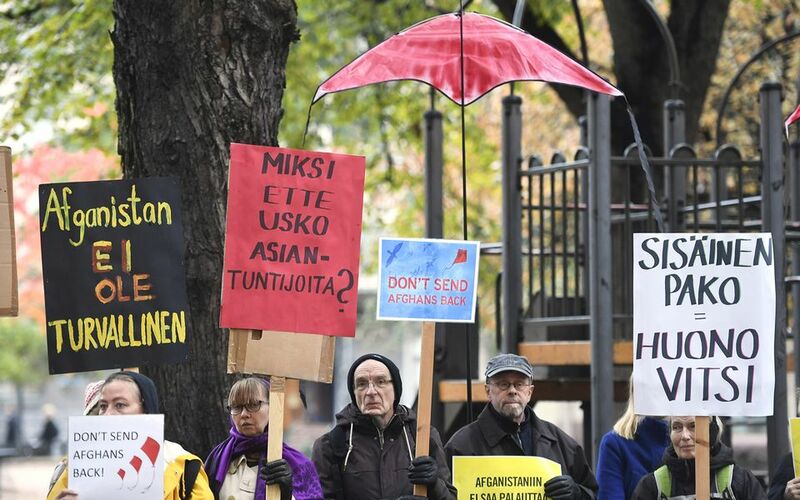 The demonstrators said Finland should not repatriate rejected asylum seekers to Afghanistan until the country is deemed safe and respects human rights. According to Amnesty Finland individuals who are sent from Europe to Afghanistan face risks from ongoing conflict as well as serious human rights abuses. Last spring it was reported that Finland anticipated that the number of involuntary returns would double this year. Finnish police carried out 556 deportations in 2017, while a total of 2,600 people were repatriated that year. In September the Finnish Immigration Service (Migri) announced that due to the large number of internal refugees in the Afghan capital of Kabul, it would no longer require families with children to attempt to relocate there to escape persecution. Repatriations of healthy, working-age men and childless couples would however continue on a case-by-case basis as usual, the agency said. Earlier this month, Migri announced it was opening a new detention unit for rejected asylum seekers. At the time, Migri officials said asylum seekers can be detained if there are reasonable grounds to suspect they may go into hiding to stop the police from deporting them. In addition, asylum seekers may be kept in custody if their identities are unclear. Late last summer, several politicians from Finland's opposition parties demanded that an independent investigation into Migri's decision-making process, after a string of forced returns to war-torn Afghanistan caused a public reprimand from Amnesty International. Shortly after that, Mykkänen announced the ministry would commission a comprehensive independent study of Migri's mechanisms.